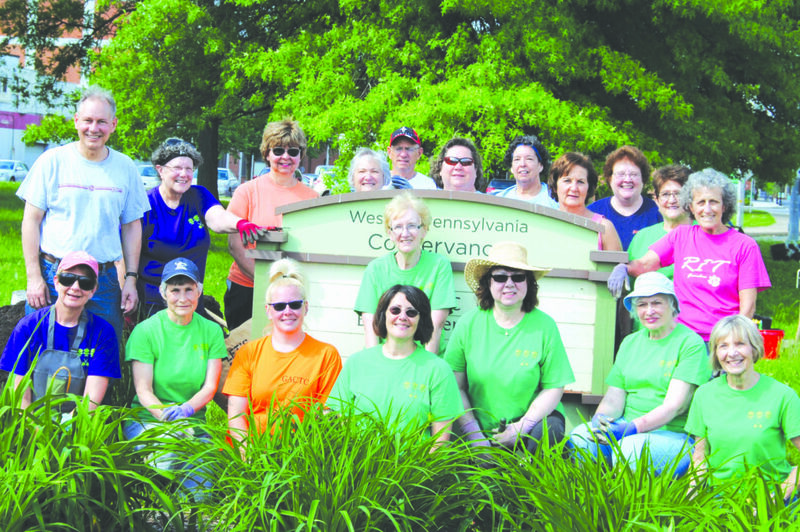 Courtesy photos Blair Garden Club, partnering with the Western Pennsylvania Conservancy that supplies the annuals and the mulch, planted the garden on the large traffic island at Seventh Street in Altoona on June 2. 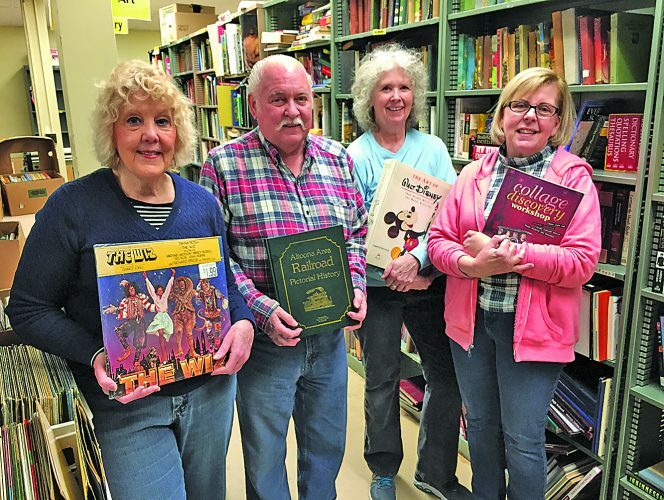 The club thanks State Sen. John H. Eichelberger Jr. (back left) for volunteering again this year. Altoona Sunrise Rotarians gathered at NutureWorks Park with Blair County Conservation District to participate in the Rotary One Tree Per Member project. Shown are (from left): Jeff Starkey, Steve Dalecki, Dave Elliott, Clay Gingrich, Joe Raia and Teddie Keritz. A total of 10 Rotarians planted various trees including sycamore, swamp white oak and Hornbeam. The 15-acre tract consists of floodplains and wetlands. It will be developed in three phases to offer teaching tools for Blair and surrounding counties. Rotarians were challenged to plant one tree per member before Arbor Day 2018. There are 1.2 million members in Rotary around the world. The park lies at the intersection of Route 36 and Bedford Street and will be undergoing development for years to come. Members of Tyrone Rotary Club planted 20 pin oak saplings on the Tyrone Hospital campus in response to a challenge made by Ivan Riseley, president of Rotary International. Scott Hiller, president of the Tyrone Rotary Club, said Riseley had challenged every club to plant one tree for each of its club members by Earth Day on April 22 to raise awareness of issues that are too rarely mentioned in Rotary. Representatives of the Tyrone Rotary Club include (from left): front row — Carla Baumgardner and Rotary President Scott Hiller; back row — Lindsey Estright, Richard Baumgardner, Rose Black, John Vandetti, Ned Newlin, Diane Irvin, Mark Zabitz and Chase Wallace. Tyrone Rotary Club members not pictured who helped with the tree planting were Jim and Roberta Ramsay and Virgie Werner. Altoona Sunrise Rotarians gathered at NutureWorks Park with Blair County Conservation District to participate in the Rotary One Tree Per Member project. Shown are (from left): Jeff Starkey, Steve Dalecki, Dave Elliott, Clay Gingrich, Joe Raia and Teddie Keritz. A total of 10 Rotarians planted various trees including sycamore, swamp white oak and Hornbeam. The 15-acre tract consists of floodplains and wetlands. It will be developed in three phases to offer teaching tools for Blair and surrounding counties. Rotarians were challenged to plant one tree per member before Arbor Day 2018. There are 1.2 million members in Rotary around the world. The park lies at the intersection of Route 36 and Bedford Street and will be undergoing development for years to come. Members of Tyrone Rotary Club planted 20 pin oak saplings on the Tyrone Hospital campus in response to a challenge made by Ivan Riseley, president of Rotary International. Scott Hiller, president of the Tyrone Rotary Club, said Riseley had challenged every club to plant one tree for each of its club members by Earth Day on April 22 to raise awareness of issues that are too rarely mentioned in Rotary. Representatives of the Tyrone Rotary Club include (from left): front row — Carla Baumgardner and Rotary President Scott Hiller; back row — Lindsey Estright, Richard Baumgardner, Rose Black, John Vandetti, Ned Newlin, Diane Irvin, Mark Zabitz and Chase Wallace. 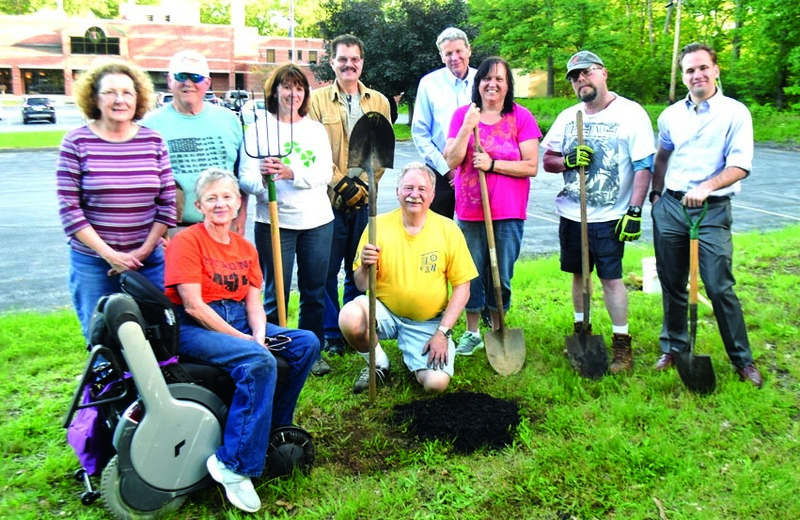 Tyrone Rotary Club members not pictured who helped with the tree planting were Jim and Roberta Ramsay and Virgie Werner.